The Black's Best: I Love Dips! This last week has been a rough one around this house. #3 has missed a week of school trying to get over a flu bug and I've been suffering from a migraine. They kill me and my productivity. I thought I would finally get around to writing a post today since it is snowy and I am all snug and comfy inside watching it fall. Yep, I'm one of those weird people who love winter and snow over summer and sunshine. I have a problem, I know. 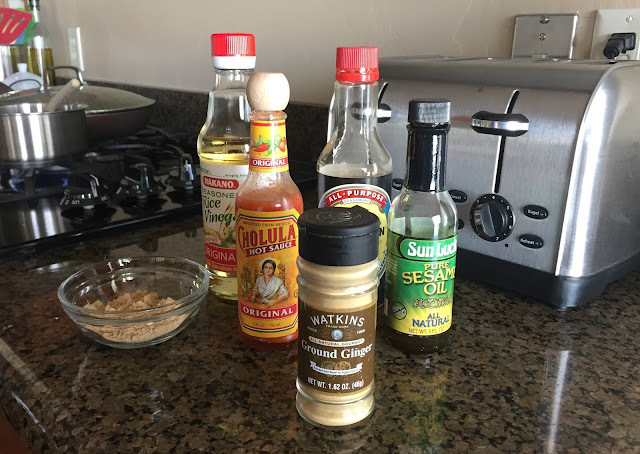 I just want to share a really quick snack fix that I love to make for lunch...all of the time. Not kidding, I think I eat these a couple of times a week. I'm talking about potstickers here. Love these little things of stuffed goodness. However, I don't think they're all that great unless you have a good dip for them. This is mostly about the dip. I believe that a good dip or sauce makes EVERYTHING better. I'm a dipper, what can I say? Put all of this together in a small sauce pan and bring to a simmer on low heat. Then just turn it off and let it sit while you make your potstickers. 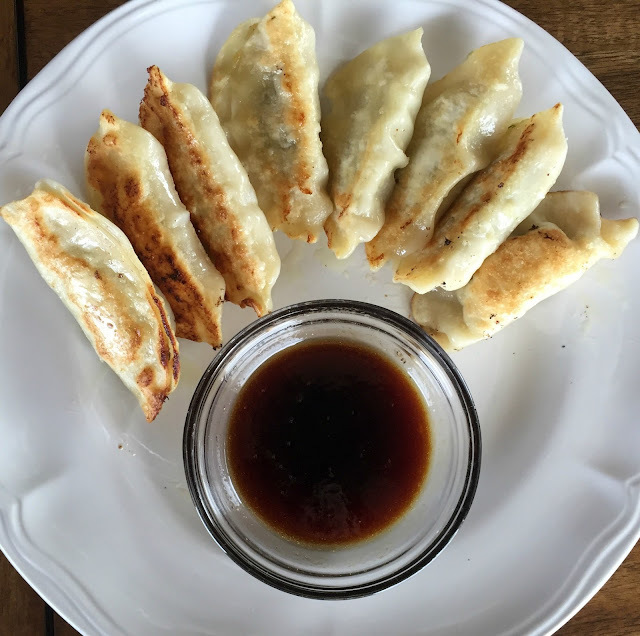 I honestly do not make my own potstickers. I buy a frozen bag from Walmart and follow the directions to cook them. 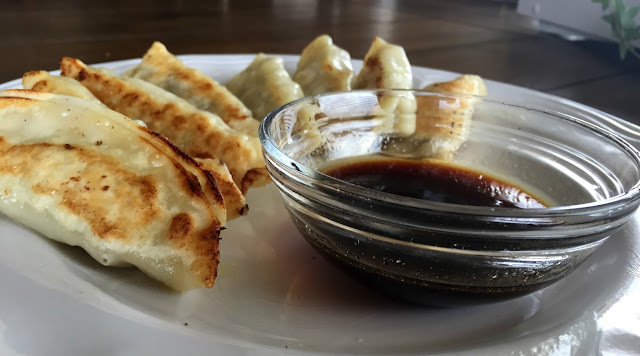 I do let mine brown just a bit because I like a bit of the soft and crunchy in my potsticker. Oh yum! I want to make these every time I look at this picture. You can always dress this up with some sliced scallions or fresh parsley but hey, I'm just eating them for lunch and I was hungry so dressing this up didn't interest me much at that time. I was lucky to get a picture. But, you know, if you want to impress company or something, go ahead and make it even prettier. This works for me for everyday though. One more shot. Are you ready to try these yet? I dare you to. They are so easy and soooo good!